Apple in 2008 started the gesture craze for traditional point-and-click PCs, but gestures will be more important than ever for PC users when Microsoft rolls out the touch-centric Windows 8 in October. To prepare its customers for the touch-based revolution, Microsoft on Monday unveiled a new set of gesture commands and associated hardware designed to make it easier to get around Windows 8 with a mouse. The navigation techniques will work with the new keyboard and mouse peripherals that Microsoft developed specifically for Windows 8 devices. 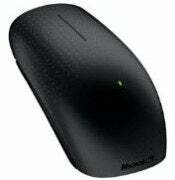 The software drivers for some older input devices may be updated to also support the gesture commands. If you are already using Microsoft's Touch Mouse, introduced for Windows 7 in 2011, the new Windows 8 gestures should feel somewhat familiar; however, there are a few changes that may take some getting used to. If you've never used Microsoft's Touch Mouse for navigating Windows 7 here are the basics: one finger lets you scroll up and down or side to side. Two fingers up maximizes a window, two fingers down minimizes, two fingers to the right or left snaps the current window to that side. Three fingers up shows you all your open windows similar to Mission Control in OS X, and three fingers down shows the desktop. You can also use a thumb gesture to move backward or forward through applications--a handy feature for going back and forth between Web pages. If you are already own the Microsoft Touch Mouse, Microsoft previously announced that your device will be getting a software update later this year to work with the new gestures for Windows 8 systems. Windows 8 gestures follow the same basic principles as Windows 7 finger movements: one finger manages content and two fingers manage apps (formerly windows). Similar to Windows 7, a one finger slide lets you scroll in any direction. A one-finger flick lets you scroll more quickly--a good way to get to the next screen of app tiles in the Start Screen. You can also use the thumb to move backwards or forwards through an app just like in Windows 7. A two-finger slide to the left displays the Windows 8 Charms Bar that includes quick access to Settings, the new Share feature, connected devices, search, and the Start Screen. A two-finger slide to the right lets you switch through open apps. Sliding two fingers up or down shows an app's commands. Presumably, sliding two fingers up in the Metro version of Internet Explorer 10, for example, would bring up the address bar and the open tabs menu. 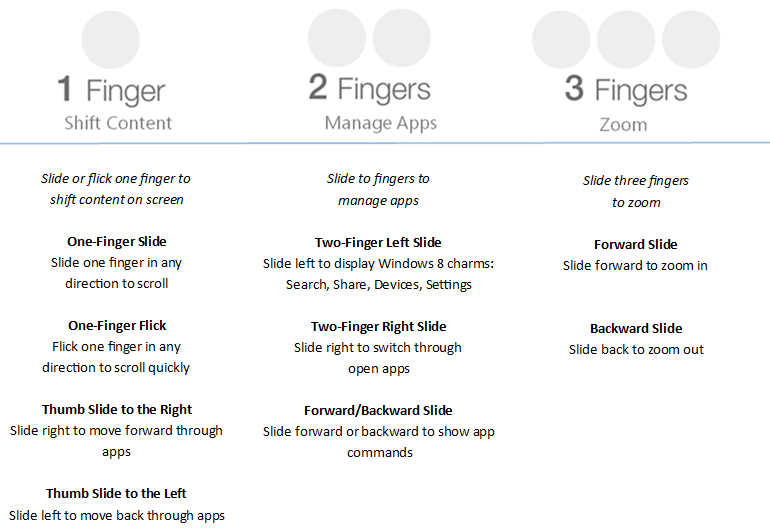 The biggest change for gestures in Windows 8 is the three-finger slide to zoom. Instead of using three fingers to show all your open windows or show the desktop (neither of which makes much sense in the full screen Metro UI), three fingers up zooms in and three fingers down zooms out. It's not clear if this behavior is system-wide or if the three-finger slide in the traditional desktop will behave the same as it did in Windows 7. It's also not clear if there will be a snap feature using gestures as Windows 7 had. Since Apple introduced the Magic Mouse in 2009 (and touchpads before that), supporting touch-based gestures in the traditional point-and-click mouse has become more important. But users have generally either loved using gestures or absolutely hated them. I'm predicting Microsoft's new touch gestures for Windows 8 will become very handy for most of us, largely because the alternatives for switching among apps or getting to the Charms Bar require you to rely on finicky hot corners or learn a bunch of keyboard shortcuts. Given the alternatives, gestures will be your best friends for navigating Windows 8.